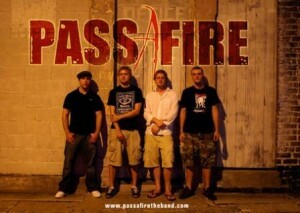 Everyone’s Irish on St. Patrick’s Day! You are invited to show off your green starting early, and continue with two days of fun-filled excitement along Atlantic Avenue. This year, in partnership with Honor Flight, over 60 WWII Veterans will lead the parade and uniformed honor guards / color guards, pipes and drum bands, from all over the world will march in colorful array. The Festival starts March 10, 2017 5pm to 10pm with the Parade and Festival March 11, 2017 11am – 7pm; the actual Parade kicking off at Noon. So enjoy all things Irish from bagpipes to the tastes of land. VIP Viewing section. 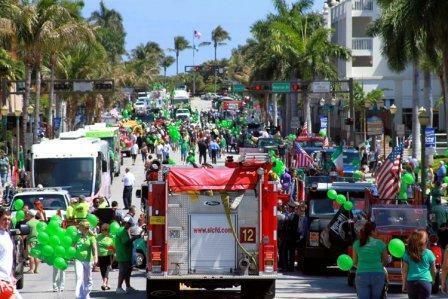 From the second floor balcony of Northern Trust Bank building, at 770 East Atlantic Ave., Delray Beach Florida, VIP participants will have a beautiful and comfortable vantage point to enjoy the parade. Food and beverages included. Air conditioned party room, and bathrooms afforded to all VIP’s. This location is also the spot the official parade review stand, with live commentary continuously describing the event and the parade entrants. This years parade will be led by 60 WWII Vets and the organization South East Florida Honor Flight. The vets while be escorted by uniformed Firefighters and Police Officers from all over the United States, and beyond. Local singing artist Sarah Crane, from the HOW foundation, will sign our national anthem, as the vets / 1st responders stop in front of Northern Trust bank. With over 100,000 square feet reserved for vendor area and several class rooms for the event, this new event will take Detail Fest to the next level and offer a unique opportunity for car enthusiasts from around the globe to gather and celebrate their shared passion for cars! 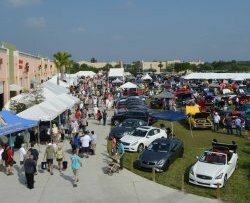 Detail Fest is open to the public and will feature car shows, product demonstrations, mini-detailing classes, food vendors and live entertainment. Detail Fest provides a chance for fans and professionals alike to meet industry insiders and celebrities in a fun and casual setting. Each year, awareness of Detail Fest grows and AutoGeek anticipates a record number of participants and spectators this year. 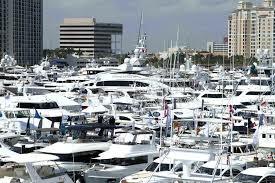 The 32nd Annual Palm Beach International Boat Show will take place in downtown West Palm Beach along Flagler Drive from Thursday, March 23rd through Sunday, March 26th. The show, which is known as one of the top five boat shows in the United States, will feature over $1.2 billion worth of yachts, boats and accessories. Also included are power boats, bow riders, personal watercraft, inflatables, seminars, fishing clinics, hands-on boat handling classes, exotic cars, live music and much more! To purchase advance tickets, please click here. The Barrett-Jackson West Palm Beach Auction will once again bring The World’s Greatest Collector Car Auctions® to South Florida for one of the country’s most anticipated automobile and lifestyle events, April 6-8, 2017, at the South Florida Fairgrounds in West Palm Beach, FL. Admire over 700 exceptional vehicles and hundreds of authentic vintage automobilia pieces as they cross the block (most at No Reserve). Experience exciting Ride ’N Drives and Thrill Rides from Ford, Chevrolet and Dodge. Rub elbows with celebrities. 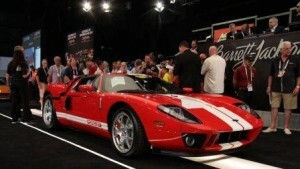 Go on a shopping spree in the vast Barrett-Jackson Marketplace. The Barrett-Jackson West Palm Beach Auction is an experience like no other. Specializing in providing products and services to collector car owners, astute collectors and automotive enthusiasts worldwide. Barrett-Jackson produces “The World’s Greatest Collector Car Auctions™” in Scottsdale, Palm Beach, Northeast, and Las Vegas. 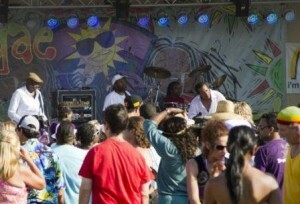 This annual family event celebrates the Caribbean culture with several Reggae bands and performers, food, arts/crafts, vendors for the whole family. 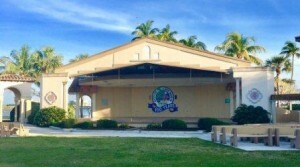 From Bryant Park, you can view the Intracoastal Waterway with lots of places to walk around and kids playground close by.